The other day, we called out to a group of friends hanging out at our kitchen studio. “Hey guys! Doughnuts are ready!” It seems that nothing can make people run faster, happily, than a batch of hot doughnuts, ready to eat. Every one of the people in the room made little happy noises and exclaimed as one. “Oh, these are good!” Only after the doughnuts were gone did we tell them these soft, cakey doughnuts were from a gluten-free mix: Dough Buddies Gluten-Free Donut Mix. We’re happy to announce that Dough Buddies is our latest sponsor. We truly believe that you’ll love this easy-to-use mix. It makes some darned fine doughnuts, gluten-free. This small company is run by two lovely women, Karen Manarolla and Pat Landy. We’ll let them tell you their story. Why did you start Dough Buddies? Pat: We met at the University of Washington in a French class, we became friends, and later colleagues as French teachers in Seattle. Continually amazed by the frequency of “like-mindedness,” it did not surprise our friends and families that we would pursue an after-teaching career doing something together. Dough Buddies – it’s all in the name! Karen: In 2006, I was diagnosed with osteoporosis caused by gluten intolerance and I loved doughnuts. Desperate in 2010 for a really delicious doughnut, I took a class on making gluten free doughnuts and a light went on! I started experimenting with recipes and brought doughnut holes to school in containers marked A, B, and C. Pat and the other language teachers would give them a try, talk about them and then send me the feedback. After about 6 months of taste testing, I had a recipe we all liked: a classic, cake doughnut that was yummy! We widened the circle of taste testers to family and friends and the responses were all very encouraging. Karen: I have always loved doughnuts and I’ve eaten a ton of them. It started with Spudnuts in Ballard many years ago, watching the doughnuts roll out on the conveyor belt and eating them warm and fluffy. In high school I ate doughnuts by the bagful. At the University of Washington my favorite breakfast was a cup of coffee with a chocolate covered chocolate doughnut. On road trips I’d buy those packaged, powdered sugar mini-doughnuts at the convenience stores. I loved doughnuts. In 2006 my doughnut eating came to a screeching halt when I was diagnosed with gluten sensitivity. I still craved doughnuts. Pat: We want everyone to have the best gluten free doughnut possible. Does that mean consumers need to make them themselves? Or, can they go to a doughnut shop and buy a delicious gluten free doughnut? We think having options is really important. And we believe that most everyone would agree, a fresh, delicious, doughnut is the absolute best. So we are looking for every opportunity to bring our doughnuts to consumers of gluten free products by marketing the mix to local grocery stores, selling through our website on the internet, and looking for restaurants with dedicated gluten free fryers or with the desire to offer baked gluten free doughnuts. Whether doughnut or donut, we have one that the whole family can enjoy! Can you tell us about the ingredients in your food and why you chose them? Pat: First off, we looked for ingredients that, when combined, would taste good naturally, unembellished – without any frostings, toppings or glazes. Karen: Taste and texture drove the creation of Dough Buddies GF Doughnut Mix. With each experiment in the kitchen we learned what the different flours and ingredients do and how they interact with one another. The three kinds of rice flours combine to create a lighter and crispier doughnut that tastes the way we remember cake doughnuts to taste. The spices are important: nutmeg, cinnamon and turmeric for both taste and health. Turmeric imparts a wonderful color to Dough Buddies, too. We found a small, certified gluten free co-packaging company in Idaho that offered us exceptionally good tasting ingredients and would make our mix in small batches. The ingredients are the highest quality milled rice flours and potato starch. We have taken great care to insure that all of the ingredients are non GMO, do not contain any hormones, that the buttermilk powder comes from non-cloned animals and that all ingredients are free of pesticides and other unwanted chemicals and additives. Our mix is Kosher certified and the facility is certified peanut free. It’s important to us that great care is taken when our mix is packaged for our customers. Pat: Our doughnuts can be fried or baked which is a real plus for the consumer. A lot of people are afraid of frying and although it’s really not that scary, we understand their fears. We suggest using a small saucepan with only a couple of inches of oil to keep the process manageable. Regular-sized doughnut holes take only a few minutes to fry, so the process moves quickly. When frying, we caution people to never leave the pot of oil unattended, never mix water and hot oil, and avoid splatters and we suggest using a thermometer to regulate the temperature. A couple of hints from veteran doughnut makers: save your oil in the fridge to use from one time to the next because it imparts more flavor to the finished product, roll the warm doughnuts in cinnamon and sugar but save some that have cooled to roll in powdered sugar. For those who prefer a baked product, we suggest using one of the little clamshell mini-doughnut or cake pop bakers. They produce a great product with our mix, too. Can you tell us a story about a customer pleased by your food? Pat: At the Mother Earth News Fair in 2012, one of our first customers was a mom with her 6 year old son. She approached our trailer and asked about the gluten-free properties of our doughnuts. Assured, she commented, “My son has never tasted a doughnut.” Wow, his first doughnut was one of OUR Dough Buddies! Karen: We bring samples of Dough Buddies to stores and restaurants and invariably we meet people who haven’t had a delicious doughnut for years because of gluten sensitivities or intolerance. When they taste our Dough Buddies, their eyes light up, a big smile comes to their face and they say, “This tastes just like the doughnuts I remember from when I was a child.” Now THAT is a thrill! What fuels you to do the work you do? Karen: Working together, we see how well our creation is welcomed and in demand. We are a great team and see eye-to eye on the goals of our company and how to achieve them. The company is growing and you never know where the path will lead. Doors are always opening to new opportunities. What started as a bright idea for two friends has become a creation that is enjoyed by many others. Pat: So many people approach our demo table saying, “I never thought I would get to have a real doughnut ever again.” It’s all about equal access, quality options, no longer feeling denied or having to make a compromise. Karen has crafted an incredible recipe that we simply need to share! Thank you, Karen and Pat, for creating this doughnut mix. We love it and we think our readers will too. Karen and Pat have kindly agreed to giveaway three packages of their Dough Buddies donut mix. Please leave a comments about donuts (or doughnuts) and why you might like to try Dough Buddies. If you’d like to know more about why we do sponsorships on this site and how we do them, please read this. Winners have been chosen and notified. Thank you for your comments! I really haven’t had a good donut in the three years since I was diagnosed. If I knew I could make them at home, I’d know they’d be safe and I could afford them! Last summer I tasted my first donut in 5 years when the gluten free bakery in my town started making them. I’ve always been too timid to try and make them on my own though. I’d love to try this mix and face my donut making fears! I am so excited about this mix. I tried this weekend to find gluten free donuts with no success. I would love to try this mix! I think it should say we’ll let THEM tell you their story in the third paragraph of text, just before the first interview question. Just a heads up! Oh my goodness I miss donuts so much! There are so many donut recipes out there lately and each one makes me a little hungrier and a little sadder. If I can make them and they taste like REAL donuts, it would be a little bit of heaven. Being GF for almost six years I just tried making my own donuts at home last month after a hankering for them would not go away! I enjoy experimenting when I can and would love to try this mix. Thanks for all the great info you provide! I haven’t had a donut since being diagnosed with celiac disease. These sound soooo good! I haven’t had a doughnut in a year and I miss them terribly! These sound so good. My mom used to fry doughnuts when I was a kid (strange, misshapen delicious things tossed in a brown bag filled with cinnamon sugar) and I have such an emotional tug when I think of them. Oh lusty donuts, with your sweet smell that wafts into my nose as you sit upon the break room counter. Day after day. I remember that time over a year ago when I was having a bad bad day and you convinced me to take 2 bites of you to comfort my aching heart. “Just a few bites won’t hurt!” Newbie mistake. It did hurt. For days. I declared “never again” …. Maybe…. Until now! Hooray for GF donuts! Every summer we go camping at a medieval festival. My husband makes beignets for folks and tries to make GF ones for some of us. I think the Dough Buddies would probably be much better and I would be a much happier camper. Mmmm, doughnuts! I could smell them as I read this! I’ll be buying these! I have been gluten free for 4 years now. After reading about your sweet Lucy and her symptoms, I realized my 12 yr old son needed to remove gluten from his diet. He loves, and I mean loves, donuts. I have tried some recipes and they all get the “eh” response. I’m betting these will be a hit! Thank you for all you do! I have just had to go gluten and dairy free. It is such a hard transition and I so miss the foods I used to eat. I would love to try a donut and know that it is safe. I am so tired of suffering! I have made some baked doughnuts gluten free but it has been a long time since I’ve had doughnut holes!! The description of warm doughnuts rolled in cinnamon sugar certainly has me hungry for them. Oh my goodness, I’d LOVE to have a really good gluten free donut! I’ve tried donuts from a local gluten-free bakery, but they didn’t quite hit the spot. I would love to have a really good, fresh glazed donut. I would LOVE to try these donuts! I miss Krispy Creme more than anything. Nothing hits the spot like a hot donut! I have tried to replicate my family’s donut recipe to make them gluten free, but they always come up short. I would love to surprise my sister-in-law who is celiac with a plate of these! Donuts are my favorite and most missed gluten filled food. To be able to make ones that tasted like real donuts would be amazing! Oh man, it’s been six years since my last doughnut. I would LOVE to try this! Would love to try this mix. Itd be awesome to try a fresh made donut that didnt come out of a freezer. I can’t wait to try them. I would love to win a package to try them ASAP! The frozen GF doughnuts are so very heavy. Would love to try a light, fresh doughnut! How serendipitous! I was just telling someone the other day that I miss the fresh doughnuts that my friend’s mother used to make and haven’t had a doughnut in over 5 years….would love to try these! Oh.my.gosh. Judging by the comments, I am not the only one who misses donuts! Seeing this picture made me salivate. I was lucky to visit a gluten free bakery in NYC recently–my one wish was to get a donut. Sadly, they didn’t have any! I have decided I need to make my own, but I’m a bit scared as baking, especially gluten free, is not really my strong suit. I would love to try a mix that could take some of the guesswork out. And I would LOVE to eat a donut. 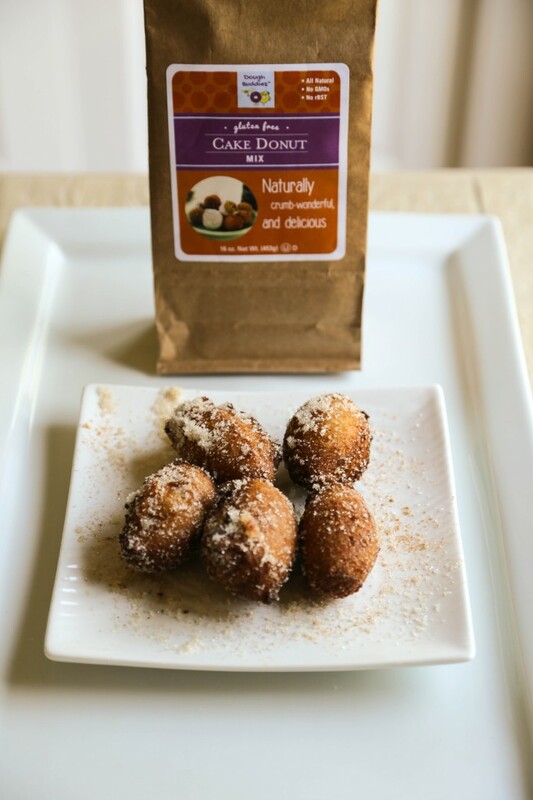 Gluten free donuts are a treat that I’ve only had frozen on occasion, thanks to KinnickKinnick, but I would love to have fresh and be able to make my own! I love the baked or fried option as well, so hope I can win or find somewhere to buy this mix! Make your way to our website, Amanda, for a list of stores in the greater Seattle area or online sales. We know you’ll find our doughnut mix easy to use and incomparably delicious! I had to go GF a few months ago. Literally two weeks later a brand new donut store opened in my little town. I was so very sad. Would love to try yours. It’s been years since we’ve had a good donut! Oh I would love to make a donut for my little girl (17yo) We have tried some of the frozen ones – not so good. I’ve been diagnosed with Celiac over 16 yrs ago – and I would love to try these donuts!!! It is our weekly tradition that I take my kids to Mighty-O in Tangletown (it is between the kids school and our home) after school on Friday, to celebrate the week. For 2 years, I’ve brought along my own gluten free/dairy free muffin to eat while the kids eat their donuts. What a treat to be able to eat a donut with them. Ok, I am a donut freak! I love them. Before our family diagnosis, I didn’t discriminate between the goodness of a warm from the fryer krispy kreme donut and the stale packaged powdery goodness for those mini donuts Karen mentioned in the interview. I simply loved all of them. I loved the convenience of dashing into any grocery store or gas station and having that sweet treat. In the 6 years since our daughter was diagnosed with celiac (and living seriously GF the last 3 years myself, meaning no sneaking junk food when I am outside the home) I have made homemade donuts a handful of times, tinkering with recipes online, and I have bought the Kinnickinick donuts as well as some that were made by a local bakery that has since gone out of business. I miss the convenience of donuts, but most of all, I miss a good glazed blueberry cake donut, or no, wait, maybe a good cream filled donut, or no, maybe a simple glazed yeast donut, or wait, no, maybe a…. Ooh, Jess, your donut dreams send us into donut heaven! We have filled our Dough Buddies with raspberry jam as well as pastry cream. With blueberries available all year long, it’s easy to add a few to the batter, too! Oh creme filled donuts! We have a fantastic homemade donut shop out here on Cape Cod (ok, we have a bunch, it’s a thing out here) and the first thing I thought of when I found out I could no longer have gluten was “No! Not Sunday Donuts!” This is fantastic! I’m so looking forward to trying these and filling them and making them even BETTER than the ones I bought from the donut shop. I have tried making donuts about 5 times over the years. One batch will get the taste right and the texture wrong, another will get the texture right and the taste wrong. I’ve given up. I would LOVE to make good ones. I haven’t had a donut in years. I keep looking up recipes and trying to find donut pans but its just not the same . . .
We suggest mixing up the batter and putting it in a plastic bag which we include with every package. The batter can be used immediately, refrigerated for a few days or frozen for later use. When you want doughnuts, just cut off the corner of the bag for the size of doughnut hole you wish, then pipe the batter into a couple of inches of oil in a saucepan heated to 350 degrees, carefully releasing the desired amount with a knife. Or, if you prefer baked, pipe the batter into a mini donut (or cake pop) appliance and cook as directed. Clean up is a snap – just throw the bag away when you are done, or refreeze left over batter for later use. Doughnuts are probably the #1 thing that I miss…even if I don’t win this giveaway, I’m going to buy this mix! I have pretty much given up on donuts. I have tried the frozen kind but they are so dense and way too sweet. Nothing like the cake donuts I used to adore. And since I am not one to eat things I don’t really enjoy, I no longer eat donuts. The idea of a fresh donut, well, my mouth is watering right now. Even most of the doughnut stores’ doughnuts are premade — these homemade doughnuts sound delicious!! I would love to try them!! Our family vacations would always start with a donut. Every summer we’d travel over 200 miles to a cabin in the woods. As we past through the tiny, sleepy town, we’d stop at the Piggly Wiggly right as it opened to each pick out a warm, fresh donut. This was thrilling for us kids because we were never allowed to eat white sugar/flour. This was well over thirty years ago, so, yes, I guess donuts hold a fond memory for me as well. I love donuts!! I miss them so much!!! I love good doughnuts!! Will give this mix a try! Growing up in the 1950’s, in the US Midwest, cake donuts and coffee (usually Folger’s ground dark brown sawdust in a gallon tin can) were EVERYWHERE. And some were much better than others. None of them topped my grandfather’s, who made them only occasionally. His were so good, that all the neighbor ladies would insist that he give lessons in his kitchen every year or so. And everyone agreed that his were always the best, theirs falling just a tad short somehow. A little part of me suspects that my grandfather, a bit of a fox, was not giving them all the steps or ingredients of his own recipe! Anyway, my standards were set for delicious homemade cake donuts from a very early age. And I’m excited to try these, based on the recommendation and the interview. And I’d even fry them. And I never fry anything. Thanks!! My husband and I were just tAlking about trying to find a gf doughnut. He takes our boys on occasional doughnut dates and I miss out. Would love to try these at home on a relaxed Sat morning with great coffee on our back porch! Would love to give them a try – baked. Donuts? Really? I haven’t had a good donut since I went gluten free, oh, 15 years ago! I really have to find this mix. I mean really!!! The smell of donuts in the bakery section of the grocery store has almost been my undoing a few times. I would love to find a gf donut that tastes good! To this day, I haven’t tried a gluten-free donut… I will be giving these a try! Thank you for sharing, Shauna. I would love this mix, just to make them and prove to my husband that when you have a good product you really can’t tell the difference. And you can live gluten- free and have your donut and eat it too. We know just how you feel, Melissa. Pat’s husband was a skeptic, but we won him over and now he begs us to fix him some Dough Buddies, too! Like everyone my DH loves & misses donuts. French crullers (not cakey) are my fave but we also love cinnamon sugar holes. I’ll bet whoever gets this great prize will have loads of fun with it! I will certainly be trying these! I miss donuts! I never fry anything, but oh how I would pour some oil in a pan and heat it up to taste these donuts! I will have to buy these even if I do not win! It has been more years than I can count since I’ve had a hot, fresh donut! I used to love making special trips to get warm donuts from the donut shop. Now that two of my kids and I have celiac disease, we obviously can’t do that. I’d love to try this mix and share warm donuts with them, it sounds delicious! These donuts sound amazing !! Haven’t had any since my diagnosis, and certainly do miss them. #Favoritefood!! Since I was a little kid my mom always said “Janice, you’re going to come as a donut when you die (kidding of course). I could eat a whole box of Krispy Kreme at one sitting. Being from the south, Krispy Kreme and Dunkin Donuts are around every corner. There’s nothing like a Hot & Ready KK donut! Diagnosed16 mos. ago as gluten sensitive, I knew this meant I would have to give up donuts. I would love to have one of yours, I miss them. THANK YOU for putting in the time and effort to put this together. I’ll be ordering mine online until we can convince the Whole Foods Stores in LA to carry your product. Let me know if I can help! Thanks for your words of encouragement and support! We are trying to expand our distribution and everyone spreading the word about our Dough Buddies Gluten Free Donut Mix will definitely help. In the meantime, you can find us online and we’ll ship it right to your door! So interesting! I never thought about creating a gluten free doughnut. Great product! With all the spices and care that seems to put into these donuts – I’m already interested! Dough Buddies seems to be doing something unique, I look forward to looking into the product! These sounds delicious. I haven’t had a donut in the almost 4 years since I was diagnosed with celiac and while I have baked many things I haven’t yet attempted donuts. Having a mix would be a great way to start. They are such a wonderful comfort food. I don’t usually use mixes for my baking, but since becoming gluten free five months ago after a celiac diagnosis (after 15 years of serious illness), I am rethinking that philosophy. Sometimes I just don’t want to mess with all those flours and precise measuring. To have that part done for me lightens the load. I am a retired teacher, so it is exciting to see fellow teachers discover a new career! Yes, in the best of all worlds, wouldn’t it be great to go out for a beverage and a fresh gluten free totally delicious donut?! We’re working on that, too! Until then, our Dough Buddies GF Donut Mix is here for you to make donuts the way you like them. A Danish donut! Donuts in Denmark. I can’t imagine it and a gluten free one at that. I was 22 years old when I tasted my first donut. That was long ago and back when I lived in Canada. I still visit and when I do, I enjoy all kinds of gluten free food, mostly breads that I can’t get here. I make my own, but they’re not at light or as tasty as some of the breads available at Whole Foods Stores in Toronto. So want to try these! Have done the baked ones from a certain flour company, just not the same…. I’ve tried Dough Buddies and wanted to encourage all of you interested to order them! I came across Pat and Karen sampling their delicious donuts at the Whole Foods near my house, less than a week after two of my daughters were diagnosed with celiac disease. I made these with my 9 year old daughter and her friend after a sleepover and they were SO good. The girls loved helping — they mixed the dough together, I piped it into the hot oil, one of them flipped them and the other dipped them in powdered sugar or cinnamon and sugar. We’ll be ordering more. Thank you, Stephanie, for this personal testimony as to the deliciousness of our doughnut mix. We love hearing that our Dough Buddies brought smiles to doughnut loving faces! This past winter, my 3-year old son wanted to do two things he’d never done before: ride a city bus and eat a donut (inspired by a Saveur magazine article). So one blustery winter day we hopped on a bus heading South, down to Buckeye donut. I took him to the counter and his eyes became huge as he scanned the wire bins of maple glazed, sugar n’ cinnamon, chocolate on chocolate. He settled on what used to be my favorite, peanut. I salivated while I watched him make quick work of the tasty golden torus of perfection and lived, for just a moment, vicariously through him. Now I can have my cake and eat it too. Thanks Shauna and Dough Buddies!